Thank you for your time Linda, I am glad to have you today. 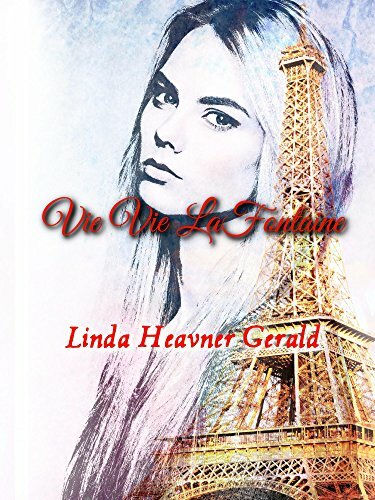 You are a published author of several books and I read recently your book VieVie La Fontaine. Your book is about historical fiction based on the World War II period. I enjoyed it and wanted to have you for an interview. I believe that my audience would be interested in your fiction novel. I will start by asking a few questions. I was inspired to write by a vision over six years ago. My husband and I once were avid sailors. We enjoyed sailing in the Beaufort, N.C. area because of the challenges it presents. Each night, for a very long time. I experienced the same vision. I saw a young woman walking in my beloved streets of Beaufort. I knew that she wasn’t me and I knew that she was not in acute danger. Night after night, this vision prevailed in my thoughts before I fell asleep. I prayed. God drew me to my computer. I didn’t understand why. I began to write. My first manuscript, Beaufort Betrayal, was written in two weeks. I was afraid to stop writing. I feared that I may lose the inspiration! Each day, since that time, that I am able, I write. God inspired me to write. My goal is to write what I feel inspired to contribute to the long list of books each year. Always, I pray for His guidance. Your recent book is a historical fiction, why did you choose history? My choice to write a historical novel was the direction of God. For a very long time, I discussed writing a book about the French Resistance. Maybe because of my visits to Paris, Normandy and the mountains of France where so many Resistance fighters are buried. WWII has always been of great interest to me. I once read everything that I could on this subject. Add to all of that the meeting which I had one night in a local restaurant. As I talked with my husband about writing a book such as this, a man across the aisle, at the next table, introduced himself. John was a Resistance fighter during the very time of my interest. He sent me photos. Without a doubt, I felt I must write this book. At the same time, I offered to raise money for the local humane society. A lady there contributed a rather large sum for a book to be written about her. I told her that God would guide me. She may be a saint or a prostitute. I said that in jest. In reality, she is both in my VieVie La Fontaine. How did you decide to write a fiction novel about France? I chose the French Resistance to address but it could have easily been the Polish. They also fought valiantly. Probably, I chose France because Paris is such a great back-drop to WWII. As the decadence occurred in Berlin, Parisians continued to party and “live it up,” at least for a while. The contrast is stark between the two. Also, since I am a writer, I wanted Mark to have a tendency toward the Arts. Where better than in Paris? Another reason is the creation of the Vichy state in France. What a difficult thing to watch as the occupiers were given the “keys” to the city. Yes, maybe Paris was spared severe destruction but the Vichy state created a different set of problems. Paris was indeed unique in the conditions the citizens faced and were forced to accept. How did you develop your villain in the book? My villain was Adolf Hitler. He developed himself, unfortunately. I merely followed his history. Although the history of this evil man is diabolical and frightening, at the same time, it is interesting. I have always thought that, maybe if we educate ourselves to the fall of Germany, we can avoid it ever happening again. What a scary yet fascinating period. I hate it yet, I find myself constantly reading about it. What is the plot line? the intrigue? The subplot line is the unraveling of Europe during World War II. As Berlin falls into depravity, at least in the beginning, it appears that Paris is living in denial. Maybe if the Parisians had been more vigilant in their observations, they could have been prepared and prevented turning such a beautiful city over without a fight. Paris is a unique example of the depravity of war and the horror of occupiers. May we never forget the Holocaust and those who perished. At the same time, the main plot is the relationship between VieVie La Fontaine and Mark Lichter, a young Jewish man. Their betrayal of a patriotic French general is difficult to read as they blatantly humiliate him in public. The shocking ending causes the reader to pause and reflect that judgment is sometimes given without understanding. The intrigue is the depravity, the loss of moral conscience, as the world deteriorates around the normal citizens of Europe. How could the Germans be allowed to kill innocents? So many, both in Germany and all over the world, lived in denial as they refused to accept ongoing events. Many today desire to rewrite history. That can’t be done. History lives, it is what it is and must be reported fairly without a spin or feelings of the writer. One of my desires is for readers to take away that we must never forget the Holocaust. If you study this period in history, one is amazed at how slowly Hitler rose. Actually, I can understand how the Germans fell into supporting him. They were hurting. He offered them prosperity and annexation of areas Germany lost during the First World War. The revolting thing is that they allowed the evil to penetrate their society. As they watched the innocents experiencing hell, they could have stepped in to help, at least in the beginning. Once he established the SS Guards and others, it was too late. I hope that we never forget what happened and that we never allow history to be rewritten. History is true. It lives. We cannot rewrite it to prevent hurt feelings. To me that is wrong. My book is available on Amazon as print, kindle and soon audio. Shortly, it will be in Barnes And Noble. Thank you for your time answering my questions. I wish you all the best with your launch and I look forward to having you on our next book promotion events.